Beautiful Beachfront Home with All Resort Amenities! Description: Home on the beach lays paradise at your feet. 2125 square feet of luxurious details await you: 9' ceilings, crown molding, ceramic tile in all bathrooms and kitchen, and Berber carpet recently upgraded. 600+ square feet of balconies that overlook pristine sand dunes and white beaches are accessible from the great room, master suite, and upstairs guest bedroom. The large entertainer's kitchen includes Kenmore appliances, an island, cable TV and a breakfast bar. Stroll from the kitchen to the open dining room and great room to enjoy your panoramic view of the Gulf of Mexico. Had a big day at the beach? Relax in front of the High Def Wide Screen TV (with VCR/DVD/HBO) or with a book in front of the wood-burning fireplace. A leather sofa with double recliners and another sleeper sofa provide plenty of room to lounge. Settle into one of 4 beautifully decorated bedrooms and 3 full bathrooms. The master suite features a king sized bed, a jet bathtub with separate shower, walkout balcony, cable TV, and 2 walk-in closets. In addition to the master suite, 2 roomy second floor guest bedrooms with queen beds (one with a set of bunk beds) and 1 main floor bedroom also with a queen sized bed comfortably sleep 10. Ceiling fans cool the beachside master suite and guest bedroom. A carport that accommodates four vehicles, home security system, second floor washer and dryer, an open air shower and half bath at ground level, zoned heating and air conditioning, and generous storage throughout make your get-away totally convenient. The Plantation is adjacent to Alabama’s #1 rated golf course, Kiva Dunes, and a short drive to many more world-class golf courses. Our home is steps away from a tropically landscaped pool, cabana, BBQ area, and boardwalk over the dunes to the beach. Our entire family enjoyed the stay. Ken was easy to work with during the entire process. Very nice home. Wonderful house! Enjoyed the porch overlooking the ocean! We looked for the Arcade and were told it was no longer-they don't why you are still advertising it. The grill was in the common area by pool-We donated a Weber Grill to your house,stored it in closer underneath. The pools were great for the children-one rainy day was spent in the indoor pool. Spent a week in October. I look for three things in a vacation rental: location, condition of the rental, and cleanliness. I found that in this vacation. For location, you can't beat being right on the beach in a private home, while also enjoying all of the amenities of the Plantation (pools, tennis, workout, etc). The view from the deck is the best where you can enjoy both sunrises and sunsets while being right on the water. The condition of the rental was good. In talking with the owners, they had just replaced the floor on the main level with new tile and installed new granite countertops in the kitchen. Both looked nice. The rest of the house was in good shape. As for cleanliness, I didn't see any signs of a problem and believe me, I would have noticed. So, it passed my requirements with ease. The burrs are still around, but the owner is having the drive paved which will correct that minor problem. Overall, I had a great time and the house fit my needs.... quiet and seclusion when wanted but close to the city when I wanted some entertainment. Enjoy Gulf Shores, I did. We spent a little over a week at this house and enjoyed every minute. The closeness to the beach(right on it) and pool (about 90 ft) were great. The house is perfect for watching beautiful sunsets and just watching the waves crash on the beach from one of the 2 decks. Everything in the house was great. Had all you would need. Large kitchen, dining area, washer and dryer. 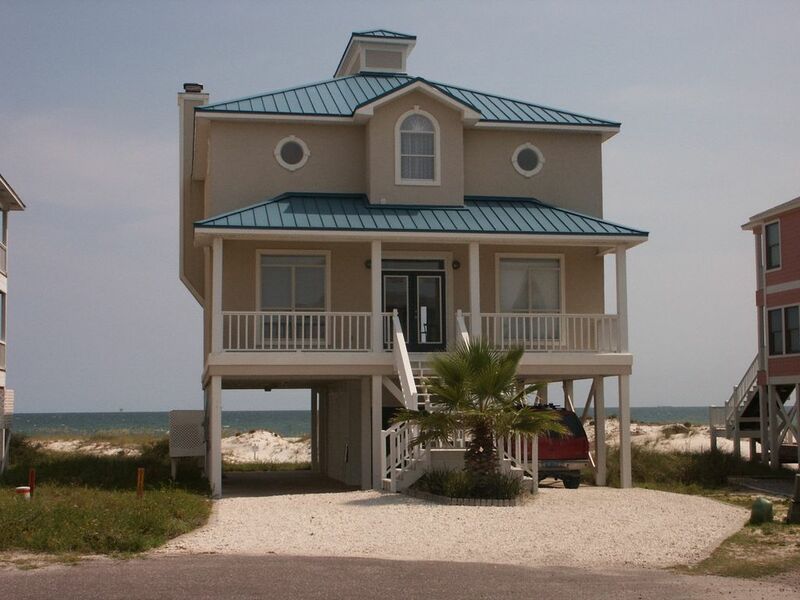 It is a perfect house just to go relax and unwind, or as a house to stay while looking at all the sights around Gulf Shores and Orange Beach. This house was right on the beach, so you could easily meander to and from as well as enjoy amazing views and hear the ocean from the house. Also conveniently next to a pool and hot tub. There were multiple tennis courts our family was able to play on daily. Outlet shopping easily accessible for the rare rainy day/recovering from a sunburn. The house itself was clean, easy to fit a large family, and thee owners were easy to contact and made setting this up a breeze. I would definitely return and tell others about this place! The positive: house has beautiful views of the ocean. It is close to pool and has a gorgeous deck in which to enjoy the views. The owner was available and easy to reach. When we arrived the cleaning people were just finishing up, which was not a problem. The problem was we had to clean the dirty countertops, table and stove. There were sandburs in the carpet and rug at the front door. We wiped off spill marks on the wall. There was food, dust, puzzle pieces under coffee table and behind sofa. The listing advertises 3 1/2 baths, but we were never able to locate the half bath. There is a pool conveniently located near the home, but it was cloudy and dirty. My daughter and daughter-in-law both used the net to clean out bugs each day we used the pool. My grandson came out of the water with a hairball stuck to his back. I spoke to personnel in the Plantation office about the condition of the pool and asked how often it was cleaned. She stated it was not the Plantation's responsibility, it was the 'Associations' responsibility. We never saw anyone clean pool or test chemicals. The picture of the outside of the home is misleading. The grass and landscaping around the home is quite overgrown. The house is showing wear. The 1/2 bath is on street level with the door facing the ocean. The burs have been a problem for a while now, so we recently paved our other house's driveway and that solved the problem. We are having this house's drive paved in late August 2014. The picture of the front was a few years old, but we wanted to wait until the driveway and new paint were put on the house in Nov 2014. We have talked to the cleaning people. I have been at the house about 2 months out of the year for over 10 years and never noticed the pool being cloudy or dirty. The maintenance people clean the bugs, but they don't follow much of a schedule on it, sometimes they show up at dawn and sometimes its later in the evening. I think they have seven pools to do each day so they tend to do them in different orders each time.